Owen has set the bar very high with her debut novel, a bar I have no doubt she will be able to surpass. Her blend of human observations, horror sensibilities, and gifted prose portend great things for her in the future. With the release of her novella “The Neighborhood” in September, you will find that she is delivering quite nicely on that potential. The titular neighborhood in the book is Neillsville, a town so small it “doesn’t even have its own Local Weather on the 8s”. It’s the kind of small town where the idea of idyllic living is far more important, and far more real, than the living itself. The kind of town where the best-kept secrets are the ones kept out in the open for everyone to see. As you are introduced to the inhabitants of Neillsville, you find they all are drawn with the richness of depth and each is given a piece of the story to tell. Owen slowly accumulates these moments, building a careful and subtle picture of a neighborhood where something is just not quite right. It’s not clear what’s off in the town, but there is no escaping it – like a fingerprint smudge across your glasses; it’s indistinct, but right there in front of your eyes. Owen does a remarkable job in creating this off-kilter ambience while still retaining a comfortable and familiar feel to the town. All the pieces of childhood are there – the major neighborhood landmark with a capital letter name (here it’s The Ravine – in my neighborhood is was The Dirt Spot), the clear social hierarchy amongst the neighbors, the feeling that the adults aren’t really listening to the kids – and more. Beneath that, however, are things not so familiar – a severed finger, a dead body, at least 2 murders, and a touch of animal cruelty. Those are things we most definitely didn’t have in my neighborhood, but it all works – and it works well. He began the more difficult hike up the path – the notion that down was always easier caught him like a fragment of a memory and then was gone again. “The notion that down was always easier” sums up all that was said and all that was left unsaid in “The Neighborhood”. It’s the story of Neillsville in six words. I don’t know how, or why, or when, but the town has taken the easy way – down. Down into a dark place that everyone has chosen to pretend doesn’t exist. As I finished “The Neighborhood”, with it’s exploration of small town living and the secrets buried just beneath the surface of even the most normal looking communities, I found myself inevitably drawn to make comparisons to “It” – my favorite Stephen King book. I resisted at first. Far too often when reviewing books, especially horror novels, people rush to crown someone the “next Stephen King”. He’s the benchmark for all modern horror writers and, let’s face it – it makes for a good pull quote from the review. With a generation of writers that have grown up reading King, his influence and impact are felt far and wide in the genre. Still, I kept coming back to what I loved about “It” and the faint echoes I heard in “The Neighborhood”. The comfortable and effortless style Owen imbues in her prose, her ability to make the ordinary both familiar and frightening, and the sensibility she brings to her storytelling are all reminiscent of “It” and Stephen King at his best. The ability to instantly connect me to a new world in a single sentence that first made me a King fan then, is the same thing that’s made me a Kelli Owen fan today. I can only hope she uses this novella for what it is – a case study, a proof of concept, a springboard. 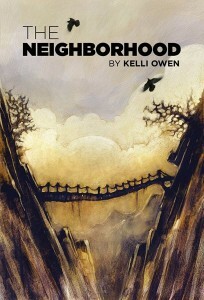 There are the seeds of a truly magnificent novel contained in the pages of “The Neighborhood”. It’s a novel I would like to read one day. “The Neighborhood” will officially be released at Horrorfind Weekend in Gettysburg, PA (September 2-4). After that, it will be available in a limited edition from Thunderstorm Books. You can find Kelli online here, on Twitter here, and on Facebook here. I’ve watched their children grow, mentally and physically, until they reach that point where the definition of neighborhood changes forever. The innocence of neighbors becomes lost within the swirl of their own maturity and memories forgotten – by age, or choice. And then they learn, or rather accept, what happens behind closed doors isn’t always private, and what happens in plain view isn’t necessarily the truth. Instead, their world is a combination of grass stains and dried mud. Badges of childhood – that often look like blood in the right light. The thought sat quietly in the back of his head, not necessarily begging to be answered, but rather, to be asked again in more depth. Scars are funny like that, Beth thought. They can all but fade away and she would forget about them, and then one day of being in the sun just a touch too long and her tan would be blemished by stark white lines to remind her. * A copy of this book was provided to thewordzombie.com by the author for purposes of this review.